While instruments and various other accessories such as pedals, headphones and stands get substantial consideration for performance, few people consider the place that their rear end will occupy on those endless hours of practice. Some even see it as an unnecessary extra expense and usually opt for the cheapest option, hoping the shop will throw it into the deal. 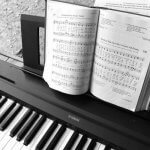 Bear in mind that the subliminal messages of comfort vs discomfort can be a huge determining factor into how much time you will want to spend at your instrument. 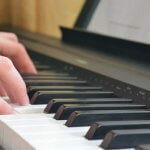 With that in mind, the choice of seating at your instrument is as important if not more so, than your choice of instrument and spending a little extra here can have a long-term effect on the enjoyment of your instrument. So in terms of benches, what is it that one should be looking for. Before I list some options here are the important considerations to explore. 1. A hard seat vs a soft padded seat. This is really a matter of taste and may depend on natural padding already available to each individual. Hard seats can become extremely uncomfortable after time especially if you tend to lack good posture and muscle support. Padded seats can tend to increase body temperature though and lead to excess perspiration (also not comfortable). Personally I prefer a hard seat that also allows one to move a little easier if needed. 2. Adjustable vs. non-adjustable seats. If you run a teaching studio and different people are going to use the bench an adjustable bench is a good investment. If you are particular about finding just that perfect position you will appreciate having the option to adjust. Otherwise if the bench is simply going to be used by yourself by all means use a good non-adjustable variety. 3. Do you need a wider bench (for duets or simply look for your instrument) or will a single seater suffice? 4. Would you like a bench that offers a compartment for storing sheet music? This elegantly rounded single-seater is sturdy, without looking thick-set. It has fake leather padding but offers firm support. The seat offered a comfortable ‘sit’ without getting that sinking feeling from over-padding. 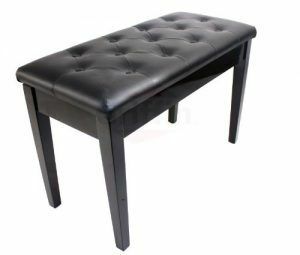 The rubber feet give the bench excellent stability and prevent movement. The wooden frame is well finished off in a polished black or brown option, giving a sleek feel. I particularly liked the fact that the bench remained firmly on the floor and didn’t slip around on a smooth tiled floor. 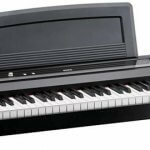 For travelling musicians, looking for a portable, easy to transport seating solution, the Yamaha PKBB1 is a must. Lightweight and collapsible, it offers a really stable, comfortable seating option that doesn’t feel as if it is about to slip out from under you at any moment. The thick support struts make it suitable for even weightier musicians. Using the same type of mechanism as a fold out keyboard stand, the seat has a few positions giving the user a range of suitable heights as may be required in different venues. It has a maximum height of 19″, which may be a little lower than some would like but offers a sturdy locking mechanism that doesn’t leave one nervous that it might collapse under you. It’s a very good buy for a padded adjustable seat that collapses with the touch of a button and will fit even into the smallest of vehicles. This is a very standard looking bench, which has a padded seat, with a wooden finish and a compartment for storing music below the seat. What makes it my choice is the price. Other benches with the same features, look and comfort, sell for even more than double the price. It is simple and elegant, with a firm support below you. The only criticism is that for some it may be slightly small at 25″ x 12″ but as a single-seater, it is enough chair for most musicians. For limited space situations and studios needing a larger number of benches without breaking the bank, this makes an excellent buy. The finish is elegant and stylish and will suit both digital and acoustic instruments. 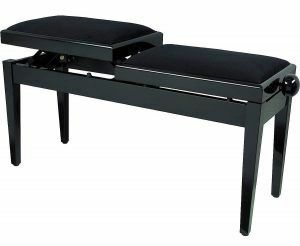 This is a great piano bench, if price isn’t too much of a concern. 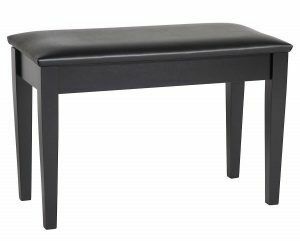 Slightly more expensive, the bench has a well finished, solid wood structure and is padded on top for extra comfort. 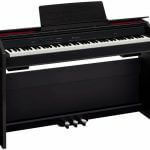 It is also large enough to be used as a duet bench and great for teaching studios and performance venues. The stool has a refined elegance with a classy, stylish finish, so makes a great piece of furniture. 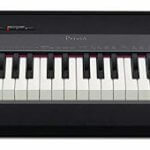 Our recommendation is that the seat goes well with the typical full digital piano rather than the more portable keyboard type or stage piano and will also suit larger acoustic instruments. It is robust and practical and adds a touch of class to upper price bracket instruments. This is one of the top professional benches. It has a side dial to adjust the height from 19″-21.5″ so that the player can achieve exacting positions in relation to their instrument. The leather padding with diamond indentation provides a comfortable seat while maintaining some air flow. The storage compartment is suitable for larger music books, and the seat itself is on the larger side although not quite suited for duet playing. It is really made for the showcase instrument or concert venue. A caution though, this bench would not be suitable for a studio where many younger (smaller) children are being taught as the height adjustment does not go low enough. This is probably one of the best benches in terms of being robust, padded, with a beautiful velvet material cover, and which looks elegant and provides excellent comfort without being too warm on the skin. It has a sturdy feel and the adjusting mechanism is easy to use and functions smoothly. It is also offers generous sizing at 55cm x 32cm, which makes it ideal for a variety of ages from beginners to professionals and can be used for duet playing. 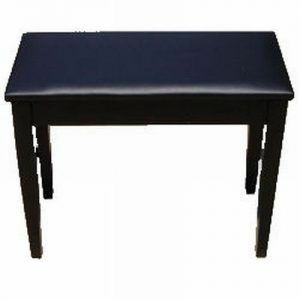 It should be a popular choice amongst schools and colleges, mainly because of its superb price for a bench that offers incredible versatility. If bought in bulk a discount could be negotiated and makes this a bargain seat with all the necessary features seen in more expensive types. 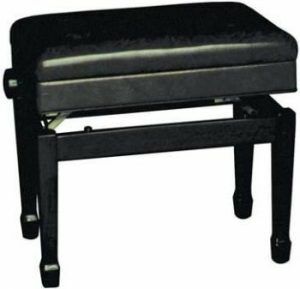 This is an elegant, old world looking piano bench that will complement any instrument (as long as it is not black). For those looking for a beautiful piece of furniture that is also usable and functional as a professional bench, this chair offers value for money. The great feature is the individual adjustability of each seat. It has comfortable, smoothly-finished, faux leather padding. It is a great solution for a home studio or soirée venue where a variety of performers may be participating. Its price makes it an excellent choice for those who want something a little different but don’t want to pay a fortune. 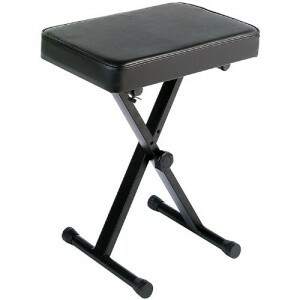 This is a stage piano seat that offers a comfortable padded seat with a modern look. The deadlock system provides a sense of security while being seated. What really makes it unique is that it has a height adjustability ranging from 19.5″-24.5″ and any height in between. 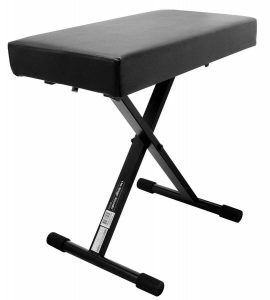 This provides versatility to performers as well as providing a stage seat for the taller performer. It has a wider seat and is well padded for extra comfort. The thickness of the padding may be a problem if it sags after use, but the padding was firm enough on a new bench to provide a stable seating solution. Piano benches are not all the same. Again we have chosen our top 8 from among the many and then rated them out of five as compared to each other. Finding a good seat can be tedious and hopefully this review will narrow the search for quality.